McCain: "I Believe I'm Going To Win"
Republican John McCain on Sunday dismissed the sour poll numbers that show him trailing in his White House race against Democrat Barack Obama and said his campaign is "doing fine." 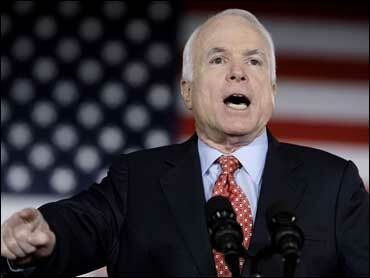 Interviewed on NBC's "Meet the Press," the Arizona senator said he has pulled closer to Obama. "We've closed in the last week," McCain said. "We'll continue to be very competitive in many of the battleground states." Recent public polls have shown McCain trailing Obama both nationally and in some of the battleground states, including Iowa, where McCain was campaigning Sunday. A Newsweek poll released Saturday showed Obama with a 13-point lead nationally. Questioned about his standing, McCain said the race is close and insisted he will emerge victorious on Nov. 4, Election Day. "This is going to be a very close race, and I believe I'm going to win it," he said. McCain said he's been heartened by the size of the crowds and the level of enthusiasm at his events. On the subject of his running mate, Alaska Gov. Sarah Palin, McCain rejected the notion that she unqualified to be president and is hurting the campaign. "I don't defend her. I praise her. She is exactly what Washington needs," he said. He also dismissed criticism about the Republican Party spending $150,000 on her wardrobe at high-end retailers. "She lives a frugal life, she and her family are not wealthy, she and her family were thrust into this," McCain said. "She is a role model to millions and millions of Americans." He continued to paint Obama as a big-spending liberal. "We have stark differences," said McCain, a conservative, characterizing Obama's economic positions as the most liberal he has seen. "His political philosophy is very different." McCain argued that he's comfortable with the state of the race with nine days before the election. "Obviously, I choose to trust my senses as well as the polls," he said. "I've been in a lot of presidential campaigns. I see the intensity out there, I see the passion. We're very competitive out there." "We're going to do well in this campaign," he said. At another point, McCain predicted: "We're going to be up very, very late on election night." McCain was headed to the University of Northern Iowa for a rally and then to the battleground of Ohio, where polls show McCain faltering in the race for that state's 20 electoral votes. Ohio gave President Bush a second term in the 2004.